Seeing a giant #SWW17 sign in the main lobby of the Los Angeles Convention Center was awe inspiring. Seeing all of the users and resellers taking their pictures around the sign was pretty great, too! The registration booth was to the left of the sign where you could go to pick up your SOLIDWORKS World materials and shirts. Too bad it wasn’t one of the amazing entered by TriMech Application Engineers Tracy or Devin! 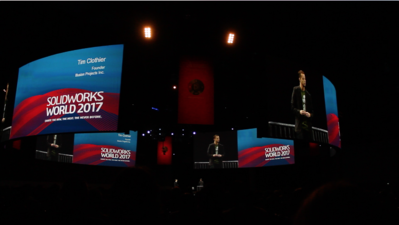 One of the coolest things about the SOLIDWORKS World 2017 Opening Ceremony (besides the large circular stage and four huge TVs) is the fact that there are thousands of people in one room with all different cultural and engineering backgrounds. 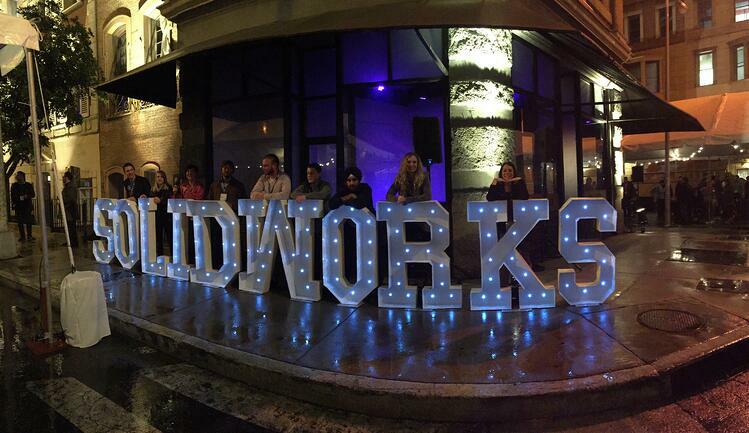 With so much diversity, we all had one thing in common — SOLIDWORKS. The session began with a mysterious metal box on the side of the stage. Little did we know that an illusionist was about to make a woman magically appear. Actor/writer/photographer Tracy B. Wilson just so happened to be our host for SOLIDWORKS World 2017. She introduced Gian Paolo Bassi, CEO of SOLIDWORKS, as he took the stage to talk about the theme of this event: The New, The Next and The Never Before. 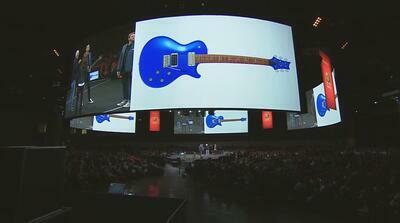 Throughout the opening ceremony, new products were introduced left and right, like Topology and SOLIDWORKS CAM. Topology is an soon-to-be-released tool to help optimize engineering goals and validate parts. The parts created can then be brought directly into SOLIDWORKS. SOLIDWORKS CAM can assist with finding tool paths needed to create the machined parts directly inside of SOLIDWORKS. In addition to new product announcements, we enjoyed a presentation from one of TriMech's clients, PRS Guitars. They turned the general session into a rock concert when guitarist Mark Tremonti from the bands Creed and Alter Bridge showed off his custom-designed instrument. Jason Silva from National Geographic's Brain Games followed with a motivational speach on how we need to exponentially take steps to help our future. After the general session, users enjoyed breakout sessions on countless aspects of SOLIDWORKS while the resellers went to sessions to learn how to better serve their customers. TriMech Application Engineers lead several breakout sessions as well including the best sessions on day one, the hands-on test drive of SOLIDWORKS Visualize Professional, lead by Paul Ludwick, Chris Duchaine and me. We had a great turnout with 32 computers set up and more than 40 people participating. We received a ton of positive feedback and even met some new faces. After the breakout sessions, the TriMech team headed to the Partner Pavilion just in time to catch TriMech Application Engineer Stephen Petrock presenting Stratasys' new F123 Series product launch on Facebook Live. >> Missed our Facebook Live event? Check out the recording on our Video page. Out of all the excitement on Day One, the biggest highlight was our customer appreciation event held Monday evening at The City Tavern. We had a great night bonding with our clients and allowing them to build closer relationships with our engineers. Plus, we got to meet former CADD Edge and CAPINC clients that are now part of the TriMech family. It was special getting to show our clients how big of a family we truly are. Download our SOLIDWORKS World 2017 Infographic for more can't-miss details about the annual event or read highlights from Day 2 and Day 3.